For those who love to over-indulge on film! 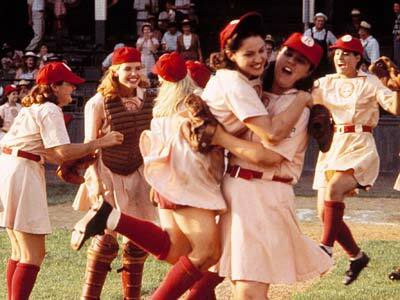 A League of their Own is based on the first women’s baseball league in America in the 1940s. While the men were at war, somebody had the bright idea of establishing a women’s baseball league. Dotti (Geena Davis) and Kit (Lori Petty) are sisters living in rural Oregon. Dotti’s husband (Bill Pullman) is fighting overseas. Dotti is the beautiful one of the family, and younger sister Kit always feels inferior. 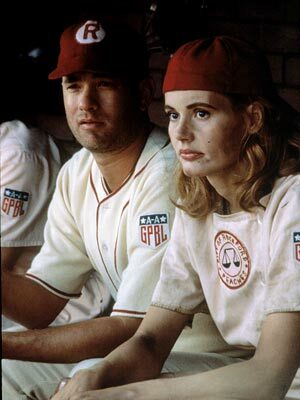 This feeling extends to baseball; when the league is scouting women, Dotti is the one they want. She encourages them to take on her sister. From here they make their way to Chicago where they try out for the teams. Here they meet some other women and future teammates. Their team is the Peaches, and they play alongside flirty Meg (Madonna), loudmouth Doris (Rosie O’Donnell), and plain Marla (Megan Cavanagh), among others. They are a melting pot of personalities that share a love of baseball. The team is assigned Jimmy (Tom Hanks) as a coach. He is a washed-up star that has spent the past 5 years drinking. He is rude and he can’t believe that he has to be with the women’s team. 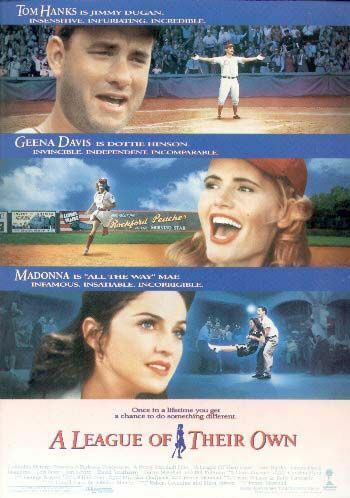 This film was directed by Penny Marshall, and her husband has a small role as the head of the baseball league. The cast are well-suited, even Madonna. It’s surprising to see her in a film because she has such an enigmatic identity, but she is actually good as May (though it’s probably not too far from her real personality). Tom Hanks has the best part here. His character is angry and moody, so a lot of the laughs come from his over-the-top anger. Some fine comedy work from him here; actually, the movie just generally elicits some good laughs in addition to the more sentimental moments. Even though this is a sports movie it also has a strong narrative. I think it struck a good balance between the games, the characters, the humour and the drama. It has a lot of spirit and Marshall is obviously very enamoured by the idea of these strong women in the 40s. The ending is really nice, and the older versions of the characters look impressively similar to their younger counterparts. I may or may not have felt a bit teary at the end (it seems like I’ve been crying in films a fair bit lately), but this has been handled really well. It’s not too sentimental but just has a hint of nostalgia. There is so much to enjoy in this film. The baseball sequences are great and it’s interesting to see the characters’ relationships develop. This is a great one for women of all ages (I remember liking it when I saw it as a child) but I think men will enjoy it too. It’s not too sentimental, and the women are really tough! Nice to see a woman directing this film also. Enter your email address to subscribe to this blog if you like my reviews!